Have a big Powerpoint presentation coming up that you’d like to edit on the fly? Want to make a few simple changes to an Excel spreadsheet on the commuter train? Don’t worry about getting out your laptop – Microsoft has finally brought Office to the iPhone. The app, unveiled today, allows you to view and make changes to any previously saved Word, Excel or Powerpoint file located in the cloud. 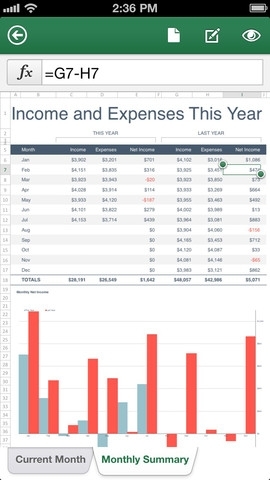 Since the app supports charts, SmartArt, and other multimedia, files appear on your phone much the same way they do on your computer screen. You know, only smaller. Before you race off to iTunes to download it, though, there are some major issues with the app you should know about. The biggest problem is that you’ll need a subscription to Office 365 to use it – there’s no stand-alone download option. And since small business subscriptions to the Office 365 service start at $6 per month, you’ll need to be a Microsoft Office power user to make the app worth your while. Another problem: Word, Excel and Powerpoint are all fairly complex pieces of software. Trying to cram any of these into a tiny smartphone box is going to be inelegant, and new users are likely to be lost until they get the hang of its unique interface. It’s good for small edits here and there, but since you can’t create new files in the app, that’s pretty much the limit to its usefulness. My recommendation: Unless you're already an Office 365 subscriber, don't bother wasting your time downloading this one. It's better spent checking out these seven free alternatives to Microsoft Office instead. The Office Mobile app is a free download on iTunes for the iPhone and iPod touch, though as mentioned earlier, you’ll need to be an Office 365 subscriber to use it. Microsoft is not making a version of the app available for iPad users.